This section will show several ways to deploy, host, and publish an A-Frame site and its assets onto the Web for the world to see. There are many free services to deploy and host a site. We’ll go over some of the more easy or popular options, but there are certainly other options such as AWS, Heroku, or self-hosting. An important note is that these sites should be served with SSL/HTTPS due to a common security restriction of the browser’s WebVR API. All the options below serve with SSL/HTTPS. Try going to the A-Frame Starter Glitch. Hit Remix your own to copy the project. Click the Project info and options icon on the top-left to rename our application (e.g., https://yoursitename.glitch.me). 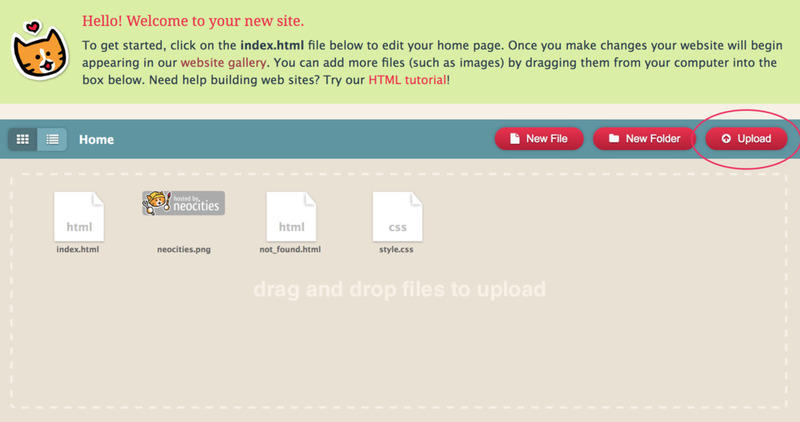 Edit the HTML, add files, modify the project. Click Show to view the application (e.g., the starter glitch is hosted at https://aframe.glitch.me). Every change to the project will update the application instantly. This can be toggled off by signing in, clicking your user avatar, and toggling Refresh App on Changes. Surge is a tool to publish web sites with a single command from the command line. This is a great tool if you’re comfortable with the command line. GitHub Pages is a preferred way of publishing our project if our project is on GitHub. The easiest way is to go our project’s GitHub Settings, scroll down to the GitHub Pages section, and set to publish master branch. This will publish the project at https://<username>.github.io/<repositoryname>. Alternatively, we can set to publish the gh-pages branch if we don’t want master changes to be published. Command line tools such as ghpages can make that a one-command publish process. We’ll also go over hosting assets such as audio, textures, models, and video. If the A-Frame site is being published alongside its assets in the same directory (i.e., the same domain), then we don’t need to worry much about hosting assets. The A-Frame site can use relative URLs to reference the asset, and since they’re on the same domain, there is no issue with fetching that asset. For example, if we have all your resources in the same root directory and we publish everything via Neocities, GitHub Pages, or Surge, there will be no issues. If we’re hosting assets externally, like on a CDN, then we need to take in considerations .The primary requirement for assets is that they be served with cross-origin resource sharing (CORS) enabled. This allows the A-Frame site to fetch the asset to display in the scene. Plus, if we’re using <a-assets>, we should usually set crossorigin="anonymous" on assets such as <img>, <audio>, and <video>. Glitch Asset Uploader - The Glitch code editor has a panel to upload assets and get CDN URLs in return. imgur - For images, we could use imgur, a popular image hosting service. 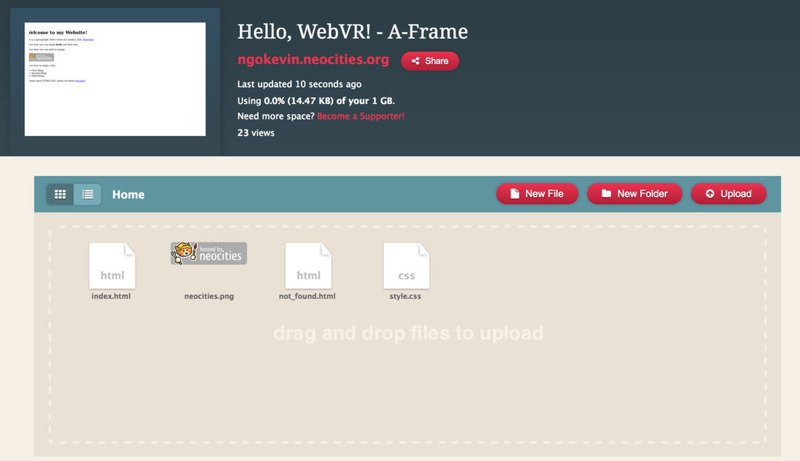 Or we can upload assets to a GitHub repository, and use GitHub to serve the model files. Go to one of our GitHub repositories. Upload our assets and wait for the upload to finish. Type a quick message at the bottom and hit Commit changes. Once finished, click on the primary asset file. Then we have our asset URL hosted on GitHub. Then the asset can be hosted and referenced via JSDelivr CDN. Once we’ve published our awesome project, we’ll want to share it so other people dive inside! A-Frame and VR are very visual; we’ll want to create videos and GIFs of our project. First, we want to record the screen. On OS X, record the screen using built-in QuickTime Player’s Screen Recording or OBS Studio. On Windows, we can use OBS Studio. OBS Studio also supports streaming and compositing a webcam image on top of the screen, which is useful to show the person using the headset in reality (even with mixed reality). Then, we can possibly want to trim the video. On OS X, we can use QuickTime Player’s trim tool (<cmd> + t). Alternatively, we can use GIF Brewery which has UI to trim, resize, crop, and preview a GIF before exporting. Or capture straight to GIF using LICECap. Twitter - Mention @aframevr or include the #webvr hashtag. Write a case study and tell us to feature on the A-Frame Blog. If we want to embed an A-Frame scene into the layout of 2D web page, we can use the embedded component to remove fullscreen styles and allow us to style the canvas with CSS. Note we can only embed one scene at a time into a page. If we need multiple scenes, we can use <iframe>s.